Andrey Esionov “Neo-nomadi e Autoctoni” - Florence is You! Fino al 28 aprile 2019 le opere di Andrey Esionov, acquarellista e maestro dell’arte figurativa russa contemporanea, sono in mostra all’Accademia delle Arti del Disegno, in Via Ricasoli n.68, a Firenze, nell’esposizione dal titolo “Neo-nomadi e Autoctoni”, a cura di Alexander Borovsky, ingresso gratuito. Il presupposto della mostra deriva dall’analisi di un evento strutturale che si sta realizzando in ogni parte del mondo: l’umanità in movimento, dai grandi flussi migratori fino al turismo di massa. Questo fenomeno non è visto con lo sguardo di chi accoglie o di chi migra, ma da una prospettiva inedita, quella dall’estraneo che è in grado di coglierne sfumature e paradossi. Le 42 opere raccontano i mutamenti e le contraddizioni di un’umanità in costante movimento, con le quali l’artista realizza una riflessione critica, surreale e pungente intorno allo scenario delle metropoli contemporanee e all’umanità che le popola. Andrey Esionov vive e lavora a Mosca, ha ottenuto prestigiosi riconoscimenti ed è presente in numerose collezioni di musei pubblici a Mosca, San Pietroburgo, Samara, in Uzbekistan e molti altri. Famoso per i suoi ritratti realizzati ad olio su tela, Esionov predilige la tecnica dell’acquerello su carta che reinterpreta in chiave contemporanea, in dialogo con la tradizione accademica e il linguaggio fotografico: passanti, artisti di strada, bambini e animali sono i protagonisti che popolano il suo mondo ed è così che prendono forma istantanee di vita, sospese tra il realismo della rappresentazione e una dimensione “altra”, simbolica. La mostra “Neo-nomadi e Autoctoni” rappresenta uno dei principali avvenimenti artistici italiani del 2019 e sarà la prima tappa di un ciclo di mostre personali volte a far conoscere in Italia l’arte, la ricerca artistica e la poetica di Esionov. 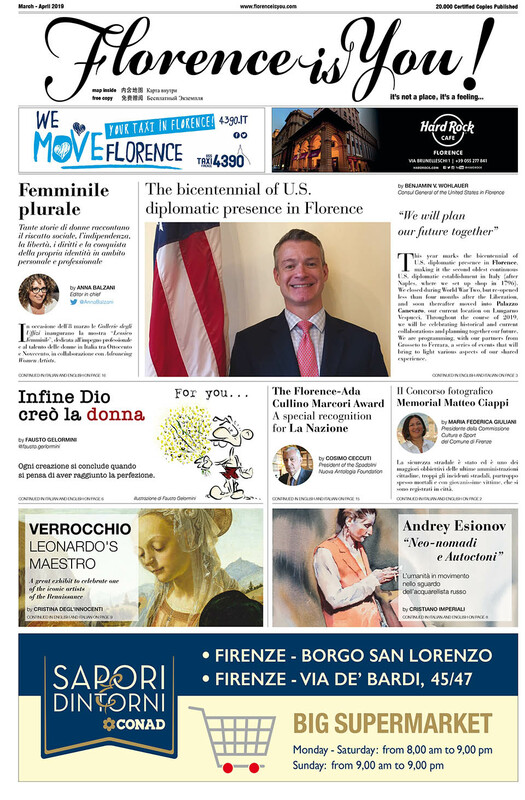 Dopo Firenze, la mostra proseguirà a Roma dove, nel mese di settembre 2019, le opere dell’artista saranno esposte nella splendida cornice del Museo di San Salvatore in Lauro. 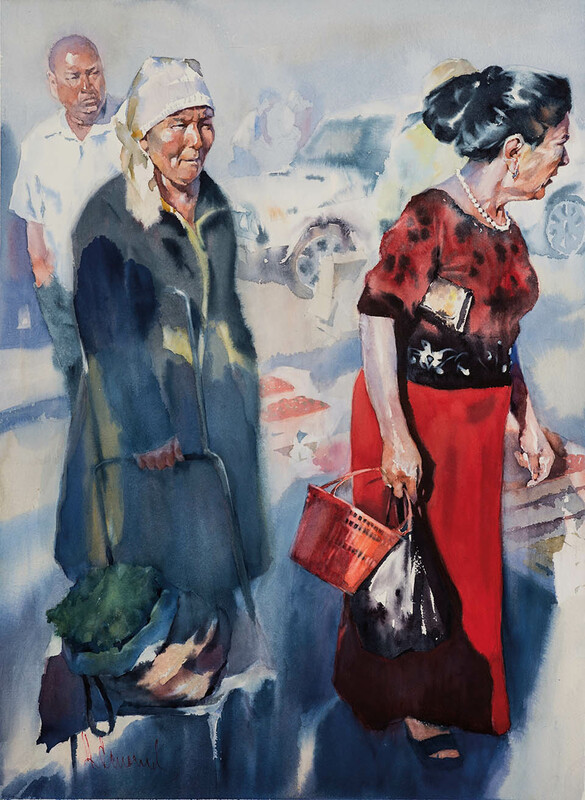 The works by Andrey Esionov, watercolourist and master of Russian figurative contemporary art, will be on show until April 28 2019 at the Academy of the Arts of Drawing, in Via Ricasoli 68, Florence, within the exhibit “Neo-nomads and Natives,” curated by Alexander Borovsky (entry free of charge). The assumption of the exhibition derives from the analysis of a structural event occurring all over the world: humanity in movement, from great migration flows to mass tourism. This phenomenon is not observed with the eyes of those who welcome or those who migrate, but rather from an unprecedented perspective, that of the stranger that is capable of capturing its nuances and paradoxes. 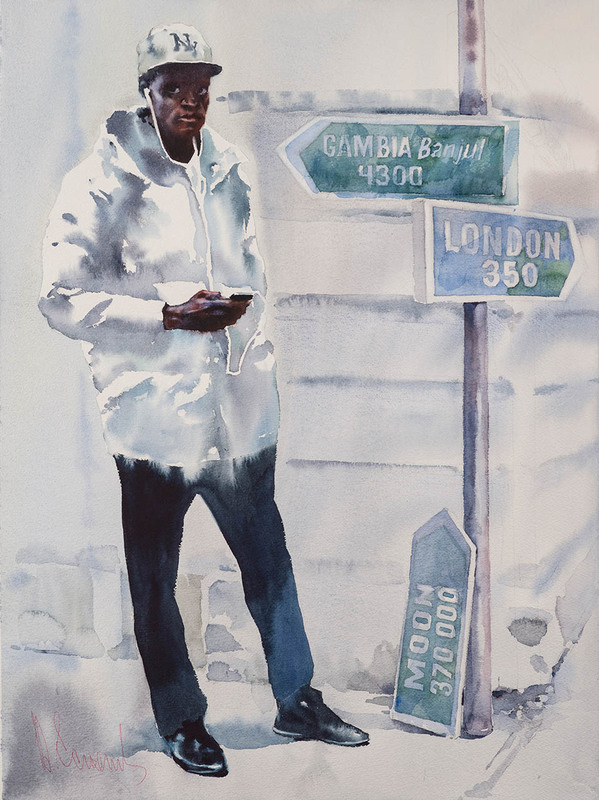 The 42 works recount the changes and contradictions of humanity in constant movement, and through them the artist accomplishes a critical, surreal and sharp reflection around the scenario of contemporary metropolises and their inhabitants. Andrey Esionov lives and works in Moscow, and has achieved prestigious awards. His works are present in several collections of public museums in Moscow, San Petersburg, Samara, in Uzbekistan, and many others. Famous for his portraits realised in oil on canvas, Esionov favours the technique of watercolour on paper, which he reinterprets in a contemporary way, in dialogue with academic tradition and photographic language: passers-by, street artists, children and animals are the protagonists that populate his world, giving form to snapshots of life, suspended between the realism of representation and “another” dimension, one that is symbolic. The “Neo-nomads and Natives” exhibit represents one of the main Italian artistic happenings of 2019 and will be the first of a cycle of personal shows aimed at garnering awareness in Italy for Eisonov’s art, artistic research and poetics. After Florence, the show will travel to Rome, where, in September 2019, the works of the artist will be showcased in the wonderful setting of the Museum of San Salvatore in Lauro.